The sisterhood of woman is a bond that cannot be broken. There was no better place to observe this than at a local quilt show. Although the subject was quilts of all types and design, watching those who came to view the quilts was a delight to behold. Mother-daughter pairs, best friends, sibling groups, and grandmothers with granddaughters --- all enjoyed the show. You could see the delight in their eyes and feel their bond as they viewed, discussed, reminisced, touched, and compared. Memories of quilts and loved ones past could be overheard as some discussed and read the history of an antique quilt or two. Two friends stitched together on antique sewing machines; they own three hundred of them altogether! Siblings dressed in flowing skirts with stockings, boots, and bows quickly moved from quilt to quilt, observing details and sharing comments on the way. Two grandmothers were wheelchair bound and pushed along by their daughters, holding grandbabies in their Grandma-laps. Avid seamstresses compared notes on quilt designs and techniques. Karleen and I enjoyed our friendship too as we shared our common interest in quilting. Sometimes we had to remind ourselves why were were there, just as the other women enjoying fellowship together did --- talking about children, spring gardens, a new recipe, and a quilt or two. A bond --- friendship and quilts. 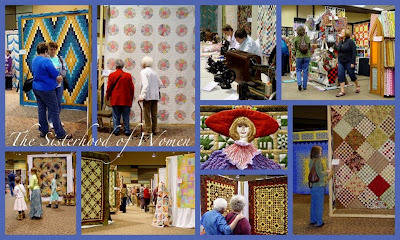 I noticed that sisterhood when I attended a quilt show not long ago. Very special! I recently attended my first quilt show and it was very fun! There were even men enjoying themselves! Very nicely said. Now I want to go to a quilt show! I blogged about your fabulous pumpkin choc chip cookies today. Thank you so much for that recipe! It sounds like such a wonderful time. Frienships are so important. We are celebrating 'Tea and friendship Tuesday's' I hope you will join us. It's not as elaborate as the tea series you hosted but it's still fun. Green Pea Soup for Spring!